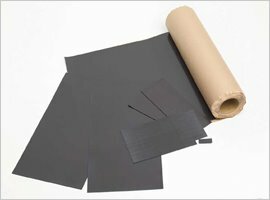 Isotropy Ferrite Rubber Magnet | SIMOTEC (THAILAND) CO., LTD. The most reasonable price for Ferrite rubber magnets. Suitable for various applications such as stationery, teaching materials, advertising panels, and signboards. The Isotropy ferrite rubber magnet, whose attraction is weaker compared to an anisotropy rubber magnet, is cheaper. It can be modified and used for various purposes including teaching materials, stationery, toys, advertisements, indication panels, and signboards. We processby cutting or taping as you want. We sell by cut sheet and full-size roll. ・We also can apply tape on both sides and PP filming. Please consult us (additional charge). ・We can cut to the size you want. We also can do punching, printing, taping on both sides, and PP filming. Please consult us (additional charge). ・Only the white product has the thickness of 0.6mm. ・We can cut to the size you want. . Please consult us (additional charge).